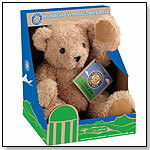 The Vermont Teddy Bear Company's “Soft Floppy Bears” are designed to give the best bear hugs anywhere. Featuring a huggable floppy body and cuddly washable fur, every bear is handmade in Vermont and unconditionally guaranteed for life. If it's ever injured, it can be sent to Vermont Teddy Bear's Bear Hospital and the company will repair or replace it for free. Zigo Leader Carrier Bicycle System by ZIGO INC.
With this mom- or dad-powered family transportation system, the user places one or two children in the ChildPod, puts on a helmet and is ready to ride. The LeaderLink System allows the Leader to uncouple in 30 seconds or less, transforming it into the separate elements, Zigo ChildPod and Zigo Cycle. The Zigo Leader can be used as a Carrier Bicycle, Stroller, Jogger (with accessory), Bicycle or Trailer (with accessory). "The Zigo Leader is the only product that allows parents to transport children in full view, unlike a rear bicycle trailer," Michael Ehrenreich, CEO of Zigo, Inc., told TDmonthly. It received a JPMA Innovation Award 2008. Launch date: April 2009. My Englacha Triple Model by ENGLACHA USA, INC. The Englacha Triple Model is a three-in-one top-swiveled stroller with seat, car seat and bassinet. It boasts a "360-degree top-swiveled function by using two fingers only," Daniel Fan, president of Englacha USA, told TDmonthly. 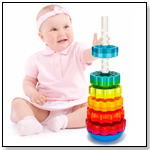 It received a 2006 Innovation Award at the 2006 Kind+Jugend in the category "World of Mobile Baby." Launch date: December 2009. The Cover-Me is a fully adjustable strap that attaches to any baby blanket, converting it into a secure nursing cover. The Cover-Me is compact enough to fit in mom's pocket. "The Cover-Me is the only breastfeeding essential that can be used for other purposes! The Cover-Me creates a secure bib using a cloth napkin or cloth diaper [and] it keeps a blanket secure over baby in a stroller or front carrier," Natascia Carr, owner of Little Carr, LLC, told TDmonthly. It received an iParenting Media Award in 2008. Launch date: February 9, 2007. Head Snuggler by MELROSE KIDS INC. The Head Snuggler is designed to safely and properly support a child's head and neck while sleeping in a car seat. It provides support from above, which helps keep children in a proper posture to promote better breathing, and thus, more restful sleep. "It's the first head support that provides support from above where it is actually needed, which helps keep children in a proper posture to promote better breathing .... It's pediatrician approved and chiropractors are even using them," Melanie Risdon-Betcher, owner of Melrose Kids Inc., told TDmonthly. The Head Snuggler received a 2009 Mom's Best Award. Launch date: March 27, 2009. Parents can protect baby in style with this infant cover that has an over-the-handle design to create a tent-like enclosuret. The hole in the top allows for a secure grip on the handle, a view of baby inside, and allows air into the baby. The all-around elastic keeps the cover securely in place. It's designed to protect babies from the sun, wind, rain and nosy strangers, and creates a cozy nap-time environment. When it's time to feed baby, Sprout Shell becomes a nursing cover to give a little added privacy on the go. At the store, Sprout Shell becomes a shopping cart cover to keep those nasty germs away from baby. It is made of 100-percent cotton corduroy and can be used for restaurant high chairs, too. It's "the only infant carrier cover that has multiple uses and can be used after baby is no longer in the infant carrier," Kirsten Reeder, co-founder of Sprout Shell, LLC, told TDmonthly. The Sprout Shell received a 2009 Baby Planner Seal of Approval. Launch date: September 12, 2009. With six, 27" square, washable nylon scarves in purple, lavender, royal blue, medium blue, kelly green and lime green, this set also includes an instructional/informational insert and IDEAS Primary Music CD along with a reusable plastic hanging storage bag. Launch date: 2008. With six, 27" square, washable nylon scarves, in red, pink, light pink, yellow, orange and peach, this set also includes an instructional/informational insert and IDEAS Primary Music CD along with a reusable plastic hanging storage bag. Launch date: 2008. With six, 27" square, washable nylon scarves in lavender, medium blue, lime green, yellow, peach and pink, this set also includes an instructional/informational insert and IDEAS Primary Music CD along with a reusable plastic hanging storage bag. Launch date: 2008. This pack includes six, 27" square, washable nylon scarves, one of each of the following colors: purple, royal blue, kelly green, yellow, orange and red. It also includes an instructional/informational insert and IDEAS Primary Music CD along with a reusable plastic hanging storage bag. Launch date: 2008. Viewing products 551—560 out of 1181 products.